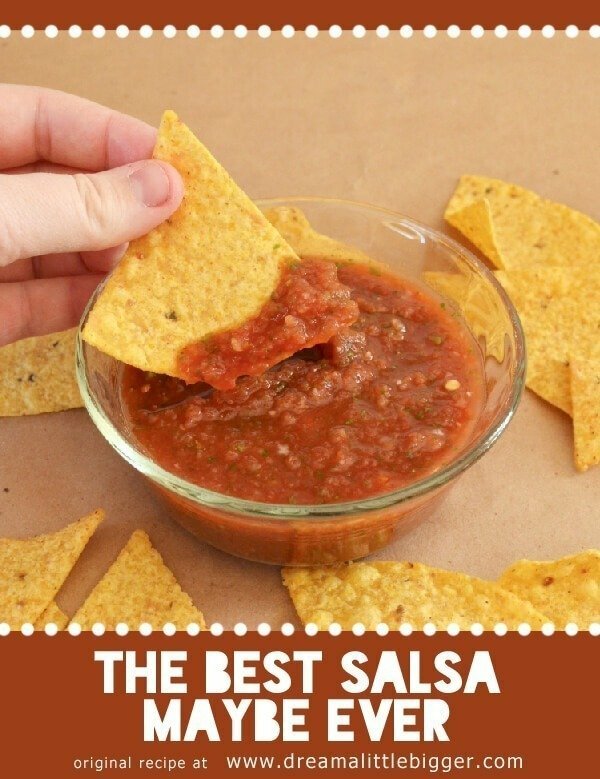 The Best Salsa Recipe… Maybe Ever! I’m not going to pussyfoot around this. Russell makes the best salsa ever. I mean this stuff is amazing enough that for years we earned extra money by making it, jarring it and selling it for SEVEN BUCKS a pop! And if they were somebody that knew us, we even asked for the jar back when they were done. Back in the days BA (before Allison) Russell was a vegetarian trying to add some flavor into his meatless days and nights. And somehow he developed this amazing salsa recipe and I gotta tell you, that’s pretty amazing because dude doesn’t cook hardly ever. But if you’re deseprate for a little flavor addition to your 5th Boca burger patty this week you’re bound to get a little creative. And if you’re wondering, you turn a vegetarian with homemade pot roast. Didn’t mean to do it but there you have it. Dude’s all about meat these days. Add it to cooked hamburger meat for insanely awesome tacos or burritos. Pour over scrambled or fried eggs for a little change in your morning routine (or supper for Huevos Rancheros!). Mix with cream cheese and eat with crackers like Wheat Thins. Add water and cooking sherry with a roast in the crock pot for amazing shredded beef. The Best Salsa Recipe Maybe Ever! This recipe is tailor made for big batches of tasty but mild salsa. If you’ve got a whole houseful of people to keep in appetizers or if you’re down with canning homemade food, this recipe is just for you. It yields 15 cups of amazing salsa. Take your jalapenos and cut out the inner membrane and seeds. This is where the pepper holds the most heat so keep some if you’d like some kick. Cut your bunch of cilantro just about the band holding it together. Wash the cilantro well picking out any bad leaves (a colander can be helpful). If you prefer your salsa chunky, hand chop the cilantro and toss everything together. If you prefer your salsa smooth, run the ingredients in the food processor. Since this is a large batch you’ll have to process several times. As long as you always have about half of the container filled with tomatoes the texture should remain consistent through the batch. Tuck in right away or allow to sit in the refrigerator overnight for the best flavor! I like it chunky :-) I can eat a huge bowl of this at a time! This is the same as MY perfect guacamole recipe, only I use cayenne instead of black pepper. Yum! YUM – this sounds just like my go-to salsa recipe. I would say to use only 2 cans of tomatoes & add two can of your favorite type of Rotel tomatoes in there for that extra something special. LOVE salsa – my favorite healthy way to eat it is with Celery Sticks so I still get the crunch with the calories! No celery here. Chips and chips and more chips :) Rotel sounds like it would provide an excellent kick! The :I made the salsa today. I used my own fresh tomatoes from my garden and stewed them before I made the pasta. I made sure the tomatoes, after cooking, yielded the specified 3 X 28 oz. I put all of my ingredients into the blender on chop. I found the final products so watery that you couldn’t think of picking any of it up with a chip. I finally took off most of the liquid and will use in in a soup. Any suggestions on how to avoid all of this liquid? It ended up being 3/4 of the recipie. Thanks. I’ve only used canned tomatoes for salsa but I do stew my own tomatoes. Sometimes my tomatoes have a lot of liquid that comes out after cooking that I wind up draining off prior to using. Could that be it? Can I ask how you can this? 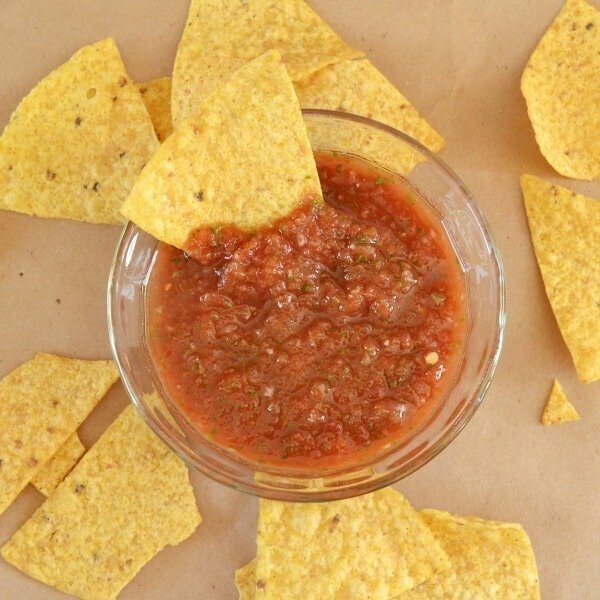 My husband is a salsa freak and I would love to make a huge batch & can it. Thanks! Sure! Now I’m not the expert as I just ladled the stuff into the jars :) But I’ll let you know what I know! Wash your jars but NOT the lids or rings. 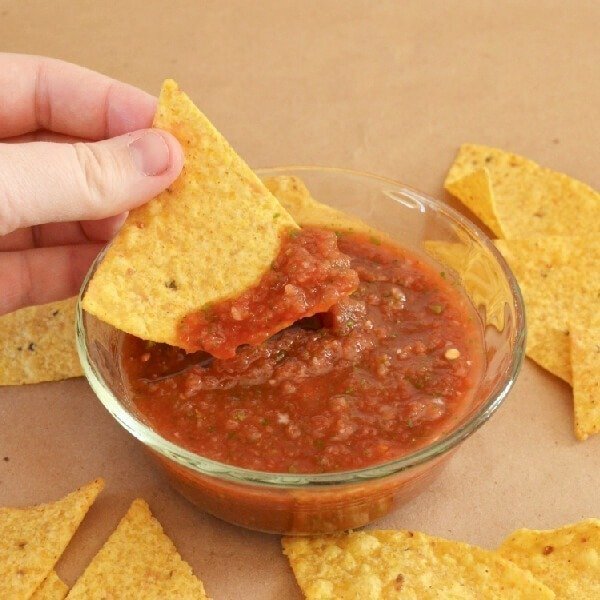 Fill them up with the salsa and then clean off the rim and threads with a rag. Make sure those suckers are pristine! Transfer them to a sink with really hot water in it. Allow to sit for just a bit before transferring them using the rack that comes with a home canner into boiling water. Oh, and this step is because often we had jars shatter in the boiling water from the shock of cool to hot so quickly so the sink thing can be a really important step! (you can buy the exact canner we use here) Allow to boil about 7 minutes and remove the rack. Allow to cool a few minutes before continuing and then remove them and place them on the counter to finish cooling. The acid helps and we’ve actually stored this for almost a year with no ill effects. Also, the heating of it makes it a little bit watery. It will be at the top of the jar. If you give it a good shake before you open it, all is good :) Let me know if you have any other questions! I made this recipe for a school project. It is the best !! Easy!! MMMMMMM THE BEST !!!! Could I sub fresh tomatoes, and if so how many? I’ve got WAY TOO MANY tomatoes!!!! Absolutely! Just add a bit more salt to taste! This is the best salsa I’ve ever made!! Thank you so much for the recipe! !